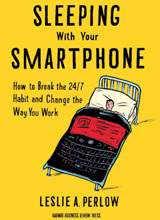 The title of Sleeping with Your Smartphone: How to Break the 24/7 Habit and Change the Way You Work is no hyperbole: A 2010 Pew Research study survey found that 65% of adults keep a handheld device at or near their heads while sleeping. Are the tools designed to make us more efficient and more productive actually making us less so? That question is the initial point of departure for Harvard Business School professor Leslie A. Perlow in her new book, the story of a modest experiment with unexpectedly profound consequences. Never being able to turn “off” leaves us both anxious and distracted, and there is a growing and crowded field of self-help books seeking to help us manage smart technology rather than have it manage us. But these books tend to focus on changes people can make on an individual level. Perlow’s contribution is to explore how a working team can confront these issues collectively. For her case study, Perlow chose the Boston Consulting Group (BCG), one of the world’s most prestigious management consulting firms, with 75 offices in 42 countries, generating $3.55 billion of business in 2011. As a top player in a highly competitive field, it is not surprising that BCG is known as a pressure cooker. If she could effect a shift in corporate culture at BCG, Perlow figured, it could happen anywhere. Before embarking on her experiment at BCG, Perlow and her associates conducted a series of surveys involving 1,600 managers and professionals. On top of long official working hours (92% reported working at least 50 hours a week and a third more than 65 hours), respondents acknowledged a substantial bloc of additional time (20-25 hours per week) during which they monitored their work even while not actively working — regularly checking email and voicemail, always at the ready should something come up. The work load is, at first, reasonable and manageable. A consultant working for a client in a different time zone, for example, makes himself or herself available well beyond the actual working day. Competition fuels this blurring of the workweek: If I don’t bend over backward for the client, goes the thinking, the competition will. But as employees become increasingly available after-hours, clients and colleagues make increasing demands on their time, making it harder to plan and regulate the workload. Perlow calls this process the “cycle of responsiveness,” with marginal increases in demands on time generating increased expectations that snowball and result in what effectively feels like a 24/7 workweek. Perlow had studied previous attempts to make the workplace more efficient and found them lacking in several respects. They tended to be top-down efforts, requiring substantial investments of time, energy and money. Moreover, any time saved by working smarter was reinvested back into the work itself, with little effect on work schedules and personal lives. By contrast, Perlow suggested a more modest and deceptively simple strategy. Working with one six-member team to start, her approach was to change workplace culture via a common goal and a common method. The goal: Each team member would get a planned night off each week. The method: a weekly team meeting to discuss how to make that happen and deal with challenges along the way. The experiment was conducted at BCG’s Boston office, whose top executive was highly supportive of the idea and allowed Perlow and her colleagues to spend a year at the company in advance, studying employees’ work habits and identifying the right team with which to start. The process was not without its rough spots and complications, and not all embraced it equally, but the results were conclusive and exceeded Perlow’s most optimistic hopes. Employees in Predictable Time Off (PTO) teams reported markedly higher job satisfaction and a greater likelihood of staying with the company long-term. Moreover, the challenge of implementing PTO fundamentally altered the team’s way of working with one another, producing a work process that participants found to be more collaborative, efficient and effective. Finally, client satisfaction rates were comparable and, in many cases, higher for projects led by PTO teams. Rather than simply summarize her findings and lay out a plan for implementing PTO on a wide-scale basis, the author takes her time and devotes the first half of the book to telling the human story of the early days of the experiment. She takes us directly into the working days and personal lives of the initial participants, documenting the trial and error of making PTO a workable reality and some of the insights and surprises that emerged along the way. The early results were mixed but encouraging: Some team members were excited by the weekly night off, but others resisted and viewed it as a burden. At the time, BCG consultants often spent as much as four days on the road, and one team member in particular complained that the required night off on the road simply took away from any time off he might have at home. The breakthrough came when the team began discussing in earnest the challenges of implementing PTO and began to realize that the experiment would succeed only if everyone committed to and benefited from it. The team’s weekly PTO meeting came to be not just an obligatory status update, but an active brainstorming session on how team members could work together to make that happen — whether that involved covering for one another, shifting workloads or altering travel schedules. At the end of the 29-week run of the first team’s project, the attitude toward PTO was overwhelmingly positive. They had succeeded in sticking to 98% of their scheduled nights off, with only 12% rescheduled. Moreover, the new time off did not turn out to be, as many feared, a zero-sum game: The average workweek, in fact, dropped from 64.5 hours to 57.7 hours. A fundamental shift had occurred. As PTO was expanded to 10 more teams, success was not universal. Perlow concludes that a full commitment to both legs of her strategy — the goal of a planned night off and a weekly meeting to discuss how to make that happen — was essential. Teams who stuck to one aspect but wavered in the other saw significantly poorer results. The key was the pairing of a measurable, actionable goal with a structured dialogue for implementing it. What surprised both Perlow and the early teams was how wide and deep were the ripple effects of this new conversation. The goal of a planned night off turned out to be a means to a larger end: an ongoing reassessment of the work process itself. As one member of the first team put it, “How much we are working and why has become a very explicit part of everything we talk about in our case team meetings.” Personal needs, once considered taboo in team meetings for fear of appearing weak or less committed than others, were voiced openly. Crucially, as well, a new dialogue took hold between junior consultants and their team leaders. The process of making PTO a reality made it safe to bring to the table other questions about the structuring and management of workloads. For instance, one project leader had a habit of passing out new assignments late in the afternoon. Because this could make it difficult to fulfill someone’s planned night off, the consultants raised the issue with their supervisor, who made an effort to distribute assignments more evenly throughout the day — not only ensuring PTO’s success, but making for fewer late nights in general. After the promising experience of the first team, the management of the Boston BCG office made a major commitment to PTO. By the end of the first year, 189 consultants had experimented with PTO, mostly from the Boston and New York offices. By the end of the second year, that number had grown to 833 and expanded across the country and to London. The third year saw 1,400 consultants involved, with offices across the globe setting up their own PTO programs. The company’s CEO declared that PTO was becoming part of its culture and a key to its future. Perlow insists that continuing to refer to new PTO teams as “experiments” was critical. The objective was to foster the notion that PTO is not a “set process but rather a mindset to be lived — a continuous openness to challenging old ways and exploring new ones.” She describes a cumulative process whereby small changes in work habits become platforms for further change, in the long-term fundamentally reshaping the work process. The new dialogue prompted by PTO generated a host of reforms at BCG. In the past, it had been common for teams to spend up to four days a week working on the road in the offices of the client. After PTO, teams engaged in explicit discussions about who really needed to be on site and for how long. Email had long been a source of tension. As part of the larger effort to more effectively manage workload, PTO teams established new protocols and even designed new computer programs to hold late-night emails until the morning and weekend emails until Monday. The teams found that the overall email load was reduced as employees took more care in deciding whether an email was truly necessary. Thus, the team leader’s primary task is to create an environment where employees feel safe taking time off in the first place, and then safe to raise the myriad practical concerns that arise in the course of sustaining PTO in the face of ongoing work pressures. On an individual level, Perlow’s emphasis on predictable time off has some potential for wider application. In survey after survey, she found that it isn’t just the total number of hours that wears on people, but the unpredictable nature of those hours. Learning to bring some level of predictability to time on and off can yield real dividends.